Maria Montessori (1870-1953), founder of the Montessori Method, was the first woman physician in Italy. Her first assignment after graduation was to provide care for underprivileged children in Rome. She developed her “method” and most of the materials common to all Montessori schools while working and observing the children at her Casa dei Bambini, or “Children’s House.” Montessori espoused a constructive, or “stage” theory of learning similar to that of Piaget. Montessori believed there are four phases of learning, or “Four Planes of Education.” She divided the first phase into two parts. The first is from birth to about 3 years of age when learning is essentially governed by the unconscious needs of the child as she begins reaching for objects, walking, and communicating. For the second stage, the one most emphasized by Montessori in her teachings and writings, she developed the materials that are the mainstay of every Montessori classroom. It is in the 3-6 year old classroom that teachers introduce the concepts of the “prepared environment,” “isolation of difficulty,” “natural sense of order,” and the “normalized child.” The two later stages of learning, ages 7-11 and 11-adult, did not particularly interest her and she developed few materials for them. While Montessori schools have expanded to include children beyond 6, the philosophy governing that curriculum is largely extrapolated from the basic 3-6 model. Montessori observed children and created materials that she felt fulfilled their natural desire to explore, classify, and assimilate their environment. She felt that materials should teach the children concepts such as length, height, breadth, shape, size, and color. She insisted that in order for a lesson to have clarity for the child, it must maintain an “isolation of difficulty.” That is, if learning a color is the goal of a lesson, the size and shape of the lesson materials must remain constant. She observed that children at this stage of development have a natural sense of order. In her “prepared environment,” the materials were placed in a certain order in the environment and the children were free to select whatever material they chose. After using it as long as they desired, they returned the material to its place “in order.” Montessori observed that when children were invited into this environment and encouraged to use the materials appropriately, they became calm, interested in discovering the concepts represented by the materials, and were able to “concentrate.” This concentration, according to Montessori, is extremely important in a child’s development into a lifelong learner. 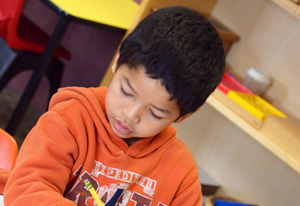 A child who is able to choose work thoughtfully, concentrate on it, return it to its place “in order,” and select another work with little or no adult intervention is said to be “normalized.” A classroom where a majority of children are working in this manner is said to be “normalized” by traditional Montessorians. Most Montessori teachers with a classroom where about 1/3 of the students are new to Montessori in September will agree that this happens in most classes about the middle of October. Throughout the years, and even in Montessori’s lifetime, educators developed new ideas about how children learn and what materials effectively help them learn. Although many of these are incorporated in the Montessori classroom, the Montessori yardstick remains the same: Can the material or teaching tool be individualized so that a child can use it independently? Does it permit the child to discover a concept rather than being led to it by the teacher? Is the difficulty isolated, and does it allow for self- correction? Of course some things the instructor must teach, such as rote counting, sounds that the letters make, and the vocabulary of discovered concepts. These are taught in three period lessons when the teacher is totally engaged in that lesson. During this time, she does not allow herself to become involved in conversation. If the child wishes to turn the lesson into a conversation, the teacher asks the child to put the work away before she engages in the conversation. What are “three period lessons”? When looking for a good Montessori environment, watch for a “normalized” class. Are the children busy and happy? You shouldn’t see a silent classroom, but the noise level should be comfortable for adult ears. Observe the interaction of the children with the materials. Are they working with the materials in an appropriate manner? The teachers should be a bit difficult to spot. They will be sitting at a small table, on the floor, or observing from a corner. Do not be concerned if a few children are simply watching other children work. Many children like to discover how to use a material in this manner. Do be concerned if children are allowed to disturb others or if a teacher calls instructions from across the room. Instruction and correction should be done quietly and individually. 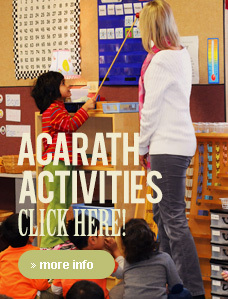 The work you observe in the class should be varied and include math, language, sensorial, and practical life (e.g. washing) activities. A classroom full of three year olds but offering no water activity is suspect. Practical life activities, especially water activities, are the key to the development of concentration and “normalization.” A child of any age who is having a troubled day can usually be calmed by water activities. Most of the children who have been in the Montessori environment for the 3-6 year period will demonstrate superior academic skills. This is not a result of the academic expectations of the school, but rather a reflection of how well the method and environment work. Children who assume responsibility for their own learning are able to pursue a skill or concept until mastery; students who are allowed to move forward at their own pace are more joyful learners. Is Montessori for every child? Most children do well in the Montessori environment because it is so individualized and because it allows for movement while learning. Some children need a more structured, one-on-one environment, particularly those with some developmental problems. Usually children who are considered “hyperactive” do well in an environment where they are allowed to move around; materials like the water activities are an excellent resource for them. Children who need help with socialization or communication, however, may find that the Montessori environment is not appropriate. Some families do not encourage their children to make independent decisions such as selecting their clothes for the day or selecting activities for play. A child coming into the Montessori environment from such a home may have difficulty initially. When parents realize that their child is far more resilient and self sufficient then they believed, they incorporate these life skills into their parenting routine and the children adapt well to the Montessori environment. While Montessori is not the perfect educational system for every child; the vast majority of children who are in this environment for several years do very well. They develop learning skills that they use throughout their lives. They enter the public or private school system well equipped academically. They have the self-confidence and independence of those who are used to making good decisions and taking responsibility for them. They have learned to respect others, both their superiors and their peers. They respect the environment and have learned to take responsibility for the care of that environment. Montessori students are lifelong learners.